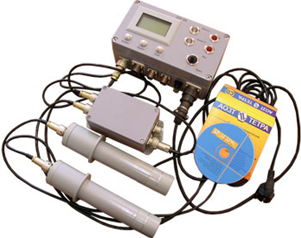 A stationary device designed to control the filling level of open and closed tanks, hoppers, columns other technological devices by liquids, suspensions, bulk materials and other media. It is an optimal device according to its characteristics to control the level of liquid with „fuzzy“ boundary between phases, liquids with hills, depressions and foam at the upper boundary of the liquid, „boiling“, agressive and flammable liquids. Mining, coal, cement, chemical, metallurgical industry, as well as the nuclear fuel cycle enterprises.